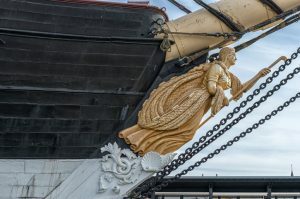 Nowadays we are used to the elegant and minimalistic lines of modern marine vessels, but not too long ago, various figureheads graced the bows of the proud ships of old. At times beautiful or grotesque, tranquil or scary, they were intended to instil fear in the potential opponent. Designed also to appease the sea Gods and to showcase wealth and power, these iconic wooden statues have been an important part of the maritime history. Together with the ship’s flag, they were one of the key elements in defining the identity and character of the vessel. They reflected a sort of heraldic image, not only of the ship itself but of its owner and Nation as well. Even today, those versed in their sometimes complex symbolism can find a plethora of content for study. For avid collectors of these maritime artefacts, they present a valuable relic and potentially a very lucrative prize. Ship figureheads have a long and fascinating history. Almost all ancient civilisations had their own versions, but figureheads had their zenith during the age of sail (1571-1862), when they reached massive sizes, becoming veritable giants of the seas. Some of the more extreme and lavish examples weighed several tonnes, so a ship that was fortunate enough to boast one of those, made quite an imposing sight. Understandably, since they were very valuable, sailors took every precaution to protect them from harm. They also believed that the figurehead returned the favour and protected sailors. With the inevitable changes in the construction of the ships, they declined in the late 19th century and eventually vanished in the early 20th century. Although they are not now in practical use, it seems that figureheads are back in fashion and in quite an unexpected manner. Until not many years ago, the very idea would sound ridiculous to all but few. figureheads popular items at auction ? This renewed interest in figureheads proves the peculiar fascination they continue to exert. They are not only stunning works of art and of great historical value, but they are also objects connected to old seafaring traditions and folklore. To our modern eyes, figureheads may seem like an odd and unnecessary waste of time and resources. However, for the seamen of old, they had real meaning and power. A belief that the figurehead is the place where the ship’s spirit resided was very common and superstitions concerning figureheads abounded. That is one of the main reasons why seamen respected them so much. Their value as an object or as supernatural forces presents only one side of the coin. There are, in fact, many more facets to this interesting topic. The figureheads could also represent different historical or mythological persons or even portraits of actual people. Even now, they continue to be as fascinating, strange, awe-inspiring and mysterious as in the time of wooden ships. So, next time you see a figurehead in a museum Here or at an auction, treat it with some respect. You can even salute it and honour an old-time seafaring custom. It can’t hurt, and if you’re really lucky, it may return the favour.